Snow falls over all of New Mexico during a typical winter and gives way to a world that is white and quiet in the mountains. 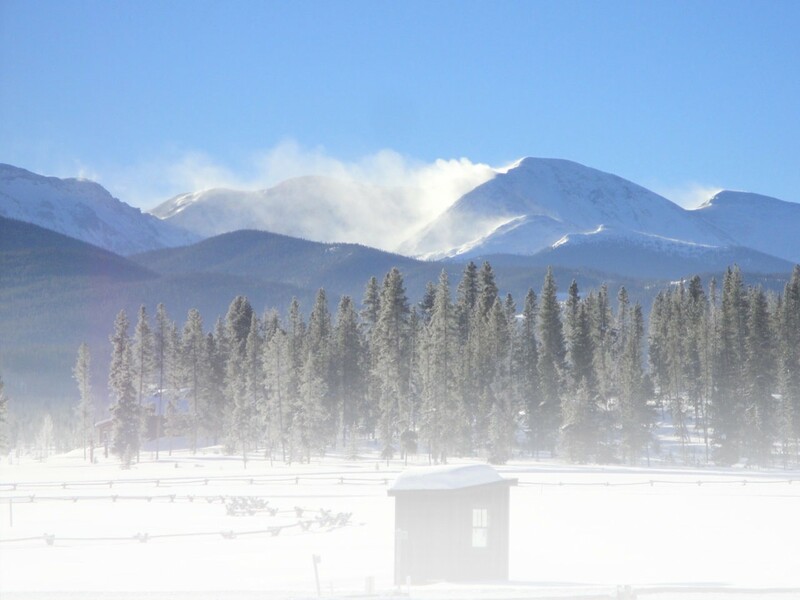 Surrounded by cobalt skies and plenty of sunshine, snowfields of gentle, rolling terrain and with elevations of 6,000 to 8,500 feet, offer ideal places for snowshoers. The Jemez (pronounced Hay-mez) Mountains, not far from Albuquerque, have many snowshoe trails that crisscross the mountain side. Old logging roads provide the routes for many of the trails that are easy for visitors to find. From Albuquerque, take 1-25 north to exit 242 and turn left over the freeway onto Hwy. 550 west. Drive past Santa Ana and Zia reservations for approximately 30 miles. At Hwy. 4, turn right onto a tree-lined road through the little village of San Ysidro. Local artisans have shops here and you can view a restored Spanish adobe church. Now you are at the beginning of one of New Mexico’s most scenic drives, the Jemez Mountain trail. You won’t be bored on your drive along the Jemez Mountain trail to your day of snowshoeing. Even during snow storms the road is plowed. Be careful though, stopping at all the sites can be time consuming and absorbing. Brilliant Red Rocks loom on either side of the road. These cliffs and mesas which are part of the Pueblo of Jemez resulted from ancient lava flows. The Pueblo of Jemez has a closed-village policy but the Walatowa Visitor Center showcases the history, culture and art of the community. Continue on to Jemez Springs village. The Jemez State Monument is close by. Stone ruins of a 500 year-old Indian village and a 17th century Catholic Church make up an important southwest historical site. In a way, age has been kind to these relics of the past, which have acquired a distinct patina. At certain angles, the pale yellow and beige stones seem to be polished. Soda Dam is not far away. The unique 300-foot long natural dam was created over the years by mineral deposits. Looking like the prow of a battleship, Battleship Rock marks the confluence of the East and West Forks where they join to become the Jemez River. Battleship was formed during the last eruptions of the Jemez Volcano. The sites with their respective historical significance are a lot to take in for a first time visitor. However, push on to either Rio Cebolla or Las Conchas trail heads. Both trails present exotic beauty and solitude along with good snow and lots of sun. Trail head: Pedestrian gate on north side of NM-4, 9.2 miles east of the junction of NM-4 and NM-126 at La Cueva. Park in the plowed area on the south side of the highway, a few hundred feet west of the trailhead. From the trailhead follow the canyon to the north and northwest to a gate where a sign describes the Las Conchas Burn which occurred several years ago. Turn left at the gate, climb to the ridge, a somewhat easy ascent and join the East Fork Ridge trail just east of the large clearing on the ridge. From here you can snowshoe either to the east or west along the ridge. Carve through groves of naked aspen trees. Weathered aspen leaves scattered among the pine needles on the trail look like tarnished coins. Shadows from the aspen trees on the trail create a spectacular black and white stripe pattern. Enjoy this short trail. Trail head: Go north out of Jemez Springs for about 20 miles on NM 126. The turnoff, northeast, to Seven Springs Campground is onto F.R. 314. There is a sign pointing to the State Fish Hatchery and another which reads “Seven Springs Campground, 1.5 miles.” Park at the side of the road. Follow this in and out trail for as long as you please. Rio Cebolla trail is at the bottom of a rock canyon. You’re likely to see elk, coyote and deer tracks. Quiet except for birdsong and with Spanish moss hanging from some of the blue spruce trees, this slow and soft trail is a snowshoer’s dream. The route starts with views of dramatic craggy rocks. Some rocks have “Swiss cheese” holes in them. Let your imagination wander and find faces in these rose colored formations. Rio Cebolla trail is quite popular with cross-country skiers, so snowshoe along the track sides so as not to disturb the path. After a day of snowshoeing, relax in wild and natural hot springs in the Jemez. If you’re hardy, jump into the Soda Dam at the side of the road. But if you prefer more comfortable surroundings, several places in the Jemez area offer soaks in mineral rich waters. Jemez Springs Bath House (www.JemezSprings.org), Giggling Springs Hot Springs (www.GigglingSprings.com) and Canon del Rio Retreat are all good choices. Hungry now after a day in the mountains, followed by a soak in natural springs? Don’t worry; there are places for snacks and dining. If you’re in the mood for an espresso, latte or café au lait, try the Highway 4 Coffee Shop (17502 Highway 4, 575-829-4655). Breads, croissants, cinnamon rolls, cookies and scones are all made from scratch. Laughing Lizard Café (17526 Highway 4, 575-829- 3108) located in an almost 100-year old adobe, is a full service restaurant which also features local arts and crafts. Don’t miss Los Ojos Restaurant and Saloon (17596 Highway 4, 575-829-3547). Esquire magazine called Los Ojos “one of America’s best bars.” With great western ambiance, including an old wooden bar and gun collection, this place has live music on weekends. The famous Jemez Hamburger and Chili Charlie are popular with locals and tourists. Now that you experienced some New Mexico magic, take your mood to an even higher level. Whether you spent a night or just a day in the Jemez, be certain to stop at the Ponderosa Valley Vineyards and Winery, off Highway 4. It’s a little known fact that New Mexico is the oldest wine producing region in the country, predating even California and New York. With that history in mind, sample one of the award winning New Mexico wines before heading back to Albuquerque. This entry was posted in Destinations, Features by Judy Post. Bookmark the permalink.